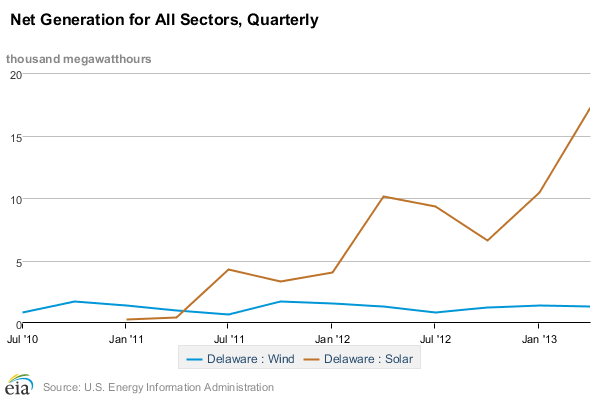 Like most states in the US, the electricity supplied to the average Delaware home comes from a mix of sources. This article takes a look at the current electricity mix in Delaware and why households should consider switching to a green power provider like Community Energy. Where does Delaware’s electricity come from? Although renewable energy technologies like wind and solar power have begun making historically significant headway in recent years, the overall energy mix of Delaware–and the US as a whole–is still largely comprised of technologies that use fossil fuels. 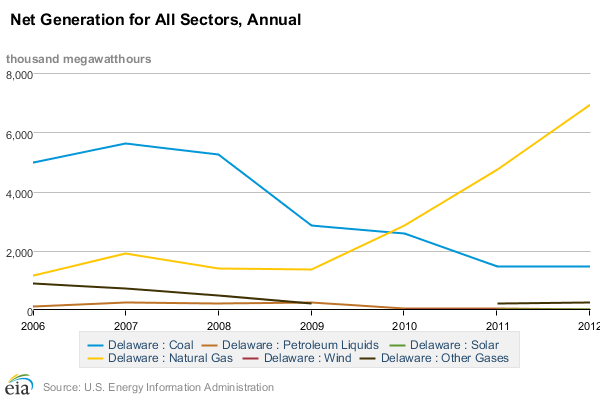 The graph to the right, from the federal government’s Energy Information Administration (EIA), shows how the composition of Delaware’s electricity has changed over the past few years, and is a microcosm of how things are changing more broadly. You’ll notice that in just around 6 years coal has been overtaken by natural gas as the main electricity fuel source in the state, thanks mainly to the nation’s recent shale gas boom. Other generation technologies–wind, solar, and a few other minor players can be found at the bottom of the chart, contributing very little to the overall mix. Looking more closely (chart to the left), it’s apparent that although solar power has started growing quickly in the last year or so, it is still absolutely dwarfed by gas and coal power. The same goes for electricity from wind power, which hasn’t increased much since it was brought onto the grid. Delaware does have plans for a clean energy future, with a Renewable Portfolio Standard (RPS) and associated energy target of 25% electricity from renewables by 2025-26, with 3.5% carved out for rooftop solar panels. Why make the switch to green power in Delaware? Delaware residents can nevertheless help speed their state’s transition to renewables by switching to a green power with Community Energy. Community energy has a history of building building new renewable energy plants across the country, and is therefore able to provide homes and businesses across the eastern seaboard with 100% renewable energy.